Marking the announcement at the Australian War Memorial, from left are Australian War Memorial Director Dr. Brendan Nelson, Sydney Invictus Games Chief Operating Officer Ben Rahilly, St Thomas More’s Primary School choir, Lockheed Martin Australia Chief Executive Vince Di Pietro AM and Invictus competitor Ben Farrinazzo. Lockheed Martin Australia has confirmed two new partnerships with the Australian War Memorial and the Invictus Games Sydney 2018. Australian Defence Force service men and women, Invictus Games athletes, dignitaries and industry representatives attended an event at the Australian War Memorial to mark the formal announcement of the partnerships and to encourage support for the Australian Invictus Games athletes competing in October. Speaking at the event, Lockheed Martin Australia chief executive Vince Di Pietro said the company was proud to honour the legacy of those who serve through its partnerships with the Australian War Memorial and the Invictus Games Sydney 2018. "At Lockheed Martin Australia we support organisations that assist members of our armed forces, past and present, and their families and friends to achieve greater understanding of their sacrifice," he said. 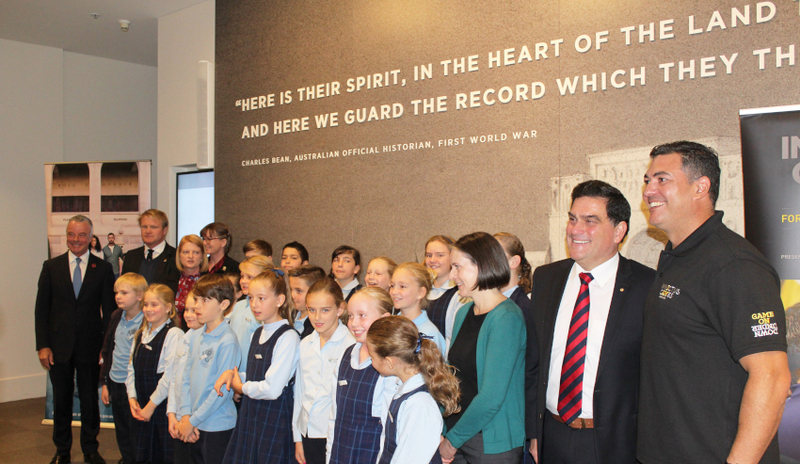 "It is in this spirit that our renewed three-year partnership with the Australian War Memorial will this year focus on initiatives commemorating the centenary of the Armistice that ended the First World War." Australian War Memorial director Dr Brendan Nelson said Lockheed Martin Australia had a long history of working with organisations that honour and support members of Australia’s armed forces. "We are proud to be associated with Lockheed Martin Australia, whose vital support enables the memorial to tell the stories of Australian service and sacrifice during the First World War and subsequent theatres of operation to more Australians than ever,” he said. “We thank Lockheed Martin Australia for its continued support." Lockheed Martin Australia said its new partnership with the Invictus Games Sydney 2018 reflects its recognition of the many challenges faced by veterans re-integrating to society post-service. "Our new partnership with the Invictus Games Sydney 2018 is testimony to our commitment to support our service men and women with programs that assist them and their families, and engender a greater community awareness and appreciation of their contribution," Di Pietro said. Chief operating officer of the Sydney Invictus Games Ben Rahilly welcomed Lockheed Martin Australia’s support as preparations continue for the fourth Invictus Games later this year. "We are grateful to have Lockheed Martin join with us on our journey to Invictus Games Sydney 2018 presented by Jaguar Land Rover. As a defence industry leader, Lockheed Martin is dedicated to supporting service members with programs that improve their lives and the lives of their families," Rahilly said. "Together we share this purpose and the partnership that we announced today will ensure the Games have an enduring impact and legacy for former military personnel well beyond October 2018." Among the Invictus competitors in attendance at the event was Ben Farinazzo, who was commissioned as an Australian Army Officer and deployed on active service as part of the International Force in East Timor (INTERFET) in 1999. Ben successfully transitioned from the military and held several board and executive leadership roles supporting the disadvantaged across Australia. In recent years, Ben and his family have faced several challenges. He was diagnosed with post traumatic stress disorder (PTSD), anxiety and depression as a result of his military service. In addition, he had a mountain bike accident and incurred multiple injuries, including fracturing his neck and spine in several places. He aims to represent Australia in rowing and powerlifting at the Invictus Games. Lockheed Martin Australia is also a supporter of Yass Valley-based not-for-profit organisation Remount. Remount is a horsemanship program designed to assist returned service men and women, and their families, to manage the impacts of loss, work-related stress, combat stress or PTSD, to re-establish their lives and develop new career paths post-service.